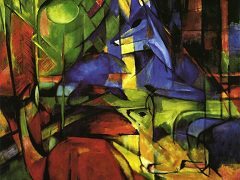 Expressionism emerged simultaneously in various cities across Germany as a response to a widespread anxiety about humanity's increasingly discordant relationship with the world and accompanying lost feelings of authenticity and spirituality. In part a reaction against Impressionists and academic art, Expressionism was inspired most heavily by the Symbolist currents in late nineteenth-century art. Vincent van Gogh, Edvard Munch, and James Ensor proved particularly influential to the Expressionists, encouraging the distortion of form and the deployment of strong colors to convey a variety of anxieties and yearnings. The classic phase of the Expressionist movement lasted from approximately 1905 to 1920 and spread throughout Europe. Its example would later inform Abstract Expressionism, and its influence would be felt throughout the remainder of the century in German art. It was also a critical precursor to the Neo-Expressionist artists of the 1980s. The arrival of Expressionism announced new standards in the creation and judgment of art. Art was now meant to come forth from within the artist, rather than from a depiction of the external visual world, and the standard for assessing the quality of a work of art became the character of the artist's feelings rather than an analysis of the composition. Through their confrontation with the urban world of the early twentieth century, Expressionist artists developed a powerful mode of social criticism in their serpentine figural renderings and bold colors. Their representations of the modern city included alienated individuals - a psychological by-product of recent urbanization - as well as prostitutes, who were used to comment on capitalism's role in the emotional distancing of individuals within cities. With the turn of the century in Europe, shifts in artistic styles and vision erupted as a response to the major changes in the atmosphere of society. New technologies and massive urbanization efforts altered the individual's worldview, and artists reflected the psychological impact of these developments by moving away from a realistic representation of what they saw toward an emotional and psychological rendering of how the world affected them. The roots of Expressionism can be traced to certain Post-Impressionist artists like Edvard Munch in Norway, as well as Gustav Klimt in the Vienna Secession, and finally emerged in Germany in 1905. The late nineteenth-century Norwegian Post-Impressionist painter Edvard Munch emerged as an important source of inspiration for the Expressionists. 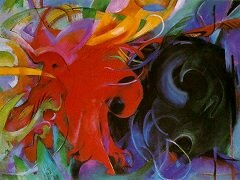 His vibrant and emotionally charged works opened up new possibilities for introspective expression. In particular, Munch's frenetic canvases expressed the anxiety of the individual within the newly modernized European society; his famous painting The Scream (1893) evidenced the conflict between spirituality and modernity as a central theme of his work. By 1905 Munch's work was well known within Germany and he was spending much of his time there as well, putting him in direct contact with the Expressionists. Another figure in the late nineteenth century that had an impact upon the development of Expressionism was Gustav Klimt, who worked in the Austrian Art Nouveau style of the Vienna Secession. Klimt's lavish mode of rendering his subjects in a bright palette, elaborately patterned surfaces, and elongated bodies was a step toward the exotic colors, gestural brushwork, and jagged forms of the later Expressionists. Klimt was a mentor to painter Egon Schiele, and introduced him to the works of Edvard Munch and Van Gogh, among others, at an exhibition of their work in 1909. Although it included various artists and styles, Expressionism first emerged in 1905, when a group of four German architecture students who desired to become painters - Ernst Ludwig Kirchner, Fritz Bleyl, Karl Schmidt-Rottluff, and Erich Heckel - formed the group Die Brücke (the Bridge) in the city of Dresden. 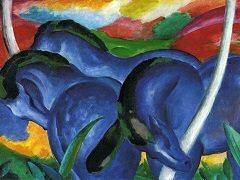 A few years later, in 1911, a like-minded group of young artists formed Der Blaue Reiter (The Blue Rider) in Munich, after the rejection of Wassily Kandinsky's painting The Last Judgment (1910) from a local exhibition. 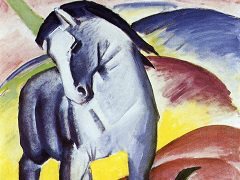 In addition to Kandinsky, the group included Franz Marc, Paul Klee, Piet Mondrian, and Marc Chagall, among others, all of whom made up the loosely associated group. The term "Expressionism" is thought to have been coined in 1910 by Czech art historian Antonin Matejcek, who intended it to denote the opposite of Impressionism. Whereas the Impressionists sought to express the majesty of nature and the human form through paint, the Expressionists, according to Matejcek, sought only to express inner life, often via the painting of harsh and realistic subject matter. It should be noted, however, that neither Die Brücke, nor similar sub-movements, ever referred to themselves as Expressionist, and, in the early years of the century, the term was widely used to apply to a variety of styles, including Post-Impressionism. The artists of Der Blaue Reiter group shared an inclination towards abstraction, symbolic content, and spiritual allusion. They sought to express the emotional aspects of being through highly symbolic and brightly colored renderings. Their name emerged from the symbol of the horse and rider, derived from one of Wassily Kandinsky's paintings; for Kandinsky, the rider symbolized the transition from the tangible world into the spiritual realm and thus acted as a metaphor for artistic practice. 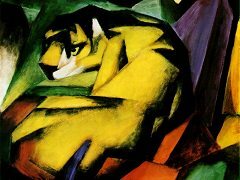 For other members such as Franz Marc, Paul, Klee, and Auguste Macke, this notion became a central principle for transcending realistic depiction and delving into abstraction. Although Der Blaue Reiter never published a manifesto, its members were united by their aesthetic innovations, which were influenced by medieval and primitivist art forms, Cubism, and Fauvism. 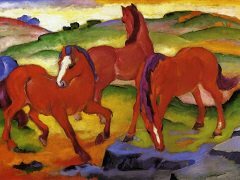 However, the group itself was short-lived; with the outbreak of World War I in 1914, Franz Marc and Auguste Macke were drafted into German military service and were killed soon after. The Russian members of the group - Wassily Kandinsky, Alexej von Jawlensky, and others - were all forced to return home. Der Blaue Reiter dissolved immediately thereafter. Expressionism's elasticity has meant that many artists beyond Germany's borders have been identified with the style. Georges Rouault, the French artist sometimes described as an Expressionist, may have influenced the Germans, rather than the other way around. He learned his vivid use of color and distortion of form from Fauvism, and, unlike his German Expressionist counterparts, Rouault expressed an affinity for his Impressionist predecessors, particularly for the work of Edgar Degas. He is well known for his devotion to religious subjects, and particularly for his many depictions of the crucifixion, rendered in rich color and heavy layers of paint. The Russian-French Jewish artist Marc Chagall drew upon currents from Cubism, Fauvism, and Symbolism to create his own brand of Expressionism in which he often depicted dreamy scenes of his Belarusian hometown, Vitebsk. While in Paris during the height of the modernist avant-garde, Chagall developed a visual language of eccentric motifs: "ghostly figures floating in the sky, the gigantic fiddler dancing on miniature dollhouses, the livestock and transparent wombs and, within them, tiny offspring sleeping upside down." 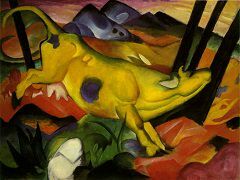 In 1914, his work was exhibited in Berlin, and had an impact on the German Expressionists extending beyond World War I. He never associated his work with a specific movement, and considered his repertoire to be a vocabulary of images meaningful to himself, but they inspired many, including the Surrealists. Pablo Picasso remarked in the 1950s, "When Henri Matisse dies, Chagall will be the only painter left who understands what colour really is." Austrian artists such as Oskar Kokoschka and Egon Schiele, were inspired by German Expressionism, but interpreted the style in their individual and personalized manners never forming an official association like the Germans. Kokoschka and Schiele sought to express the decadence of modern Austria through similarly expressive representations of the human body; by sinuous lines, garish colors, and distorted figures, both artists imbued their subjects with highly sexual and psychological themes. Although Kokschka and Schiele were the central proponents of the movement in Austria, Kokoschka became increasingly involved in German Expressionist circles; he left Austria and moved to Germany in 1910. Initially Kokoschka worked in a Viennese Art Nouveau style, but starting in 1908 he instinctively worked as an Expressionist, passionately seeking to expose an inner sensibility of the sitter in his early portraits. Schiele left Vienna in 1912 but remained in Austria, where he worked and exhibited until his death in the worldwide influenza epidemic of 1918. The original Expressionist movement's ideas about spirituality, primitivism, and the value of abstract art would also be hugely influential on an array of unrelated movements, including Abstract Expressionism. 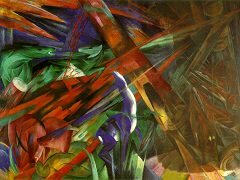 The Expressionists' metaphysical outlook and instinctive discomfort with the modern world impelled them to antagonistic attitudes that would continue to be characteristic of various avant-garde movements throughout the century.